After Edward's death, Louise's life becomes harder to document as she grows older and takes more of a back seat in her acting life. She carried on living at 331 Strand despite a couple of periods I cannot account for, including the census for 1891 when the Eltons and Bruces apper to be out of the country or the page from the census book is missing! I have looked at five different versions of the census and I assume they were abroad or in transit somewhere, though number 331 Strand is certainly missing from the address list. Two sons however, Henry and Edward are both in the census - Henry with his wife Honora and three of their children and Edward with his wife Eva and two little girls. Alfred, Kathleen, Louise and their niece and grandchild, Cassie Louise are not to be found though they do re-appear ten years later in 1901, albeit with a very odd entry. Henry, Louise's youngest son with her first husband John Bruce , who was born in 1848 in Scotland, married Honora Neagle, They were married on November 24th 1873 at the deliciously named St. Andrew by the Wardrobe church. Honora's father was Patrick Neagle from Cork, a greengrocer and Henry's father is of course, John Bruce, actor. Henry is listed as a newsagent of 331 Strand, which means the family left Nichols Square somewhat earlier than I thought. Their witnesses were George and Ann Foster. The relationship between the Fosters and the bride and groom is illuminated by the 1871 Census in which Honora Nagel (sic) is living as the head of her own household working as a greengrocer like her father while the Fosters live next door in Bride Lane. George is a printer and Bride Lane is just a few hundred yards from the Bruce's, opposite Somerset House on the Strand. In 1875 on 1st February, the couple's first children were born. They were evidently twins which came as quite a surprise to me as this follows the pattern of several sets of twins being born in our family. John, the boy named after his grandfather, did not survive however and his death is listed in the same registration period as his birth. Fortunately one of the twins did survive and it is she who has largely inspired me to write this account. 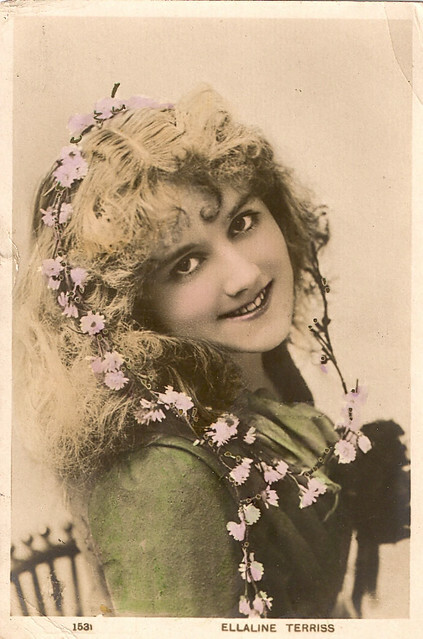 Cassie Louise, whose picture is on the first page of this site, was born on my birthday, my first cousin twice removed, she went on to have a life which I find quite amazing from the events and stories I can piece together. As far as I can tell, she did not really live with her parents for long. All the listings I can find for her show her living with the two people she was named after: her grandmother Louise, my great, great aunt and her daughter Kathleen or Casey. There are some brothers and sisters who follow and they all remain living with their parents, Honora Maude born in 1882, Edward Alfred born in 1881 and Alfred John, the youngest, born in 1889. There is a long gap between Cassy Louise and the next sibling but there are records of other children being born in that period who I suspect belonged to Henry and Honora and did not survive. In 1876, there is listed Henry Alfred, born in the period June, July, August and dying in the same quarter. There are two others born in Holborn in the late 1870s but I cannot be absolutely sure if they also belonged to Henry and Honora as thare are no christening records. Maybe it was easier for the young couple to let their little girl spend time with their grandmother while their mother was ill or recovering from childbirth but whatever occurred, Cassie Louise is not listed as living with her parents in any of the censuses in her early life. Cassie spent a great deal of time with her Uncle Alfred, Aunt Kate (I did suspect that she may have been Cassie's real mother but having reviewed more evidence, I now believe that to be unlikely), and grandmother Louise and like her grandmother and aunt before her, demonstrated a true aptitude for the stage. 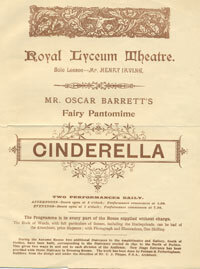 In 1893, she is appearing at the Lyceum with one of the biggest names of Victorian popular theatre: Ellaline Terriss who plays Cinderella. Cassie is playing a relatively humble part of the Fairy Brassfounder but imagine how proud she and her family were to see her name In the programme. Cassie's career blossomed over the next thirteen years or so, I like to think, helped and supported by her illustrious grandmother. One of the last mentions of Louise comes at the time of Queen Victoria's Diamond Jubilee when the seventy two year old Mrs. Elton advertises the appartment at 331 as an excellent place from which to view the royal procession. The London Standard for Wednesday 2nd June carries an advertisement which states, 'Jubilee Day - Splendid second floor to let for the above in best part of the Strand. Large room, good windows, retiring room, lavatory & c. Suit a family party. Apply A. Bruce between the hours of 12 - 3pm. I hope they were successful. After this, there are few mentions of the Eltons or the Bruces at the Strand except for the 1901 Census which lists Louise, Kathleen and Alfred as living there. Alfred is described as a cashier with Kathleen and Louise having no profession. What is odd about the entry though is the ages: Louise is stated as being 46 when she was 77, Kathleen or Kate as she is named here is 27 (she was 52 or 3) and Alfred is listed as being 27 when he was in his mid fifties. I'm not sure what went on here; it could be a simple error or maybe someone told some lies! Later in 1901, there is an article about the picture dealer downstairs applying for compensation regarding compulsory purchase of 331 Strand by the London Metropolitan Council due to improvements to the Strand. He received £9000 for the lease and loss of business. I can find no record of this happening to the Elton/Bruce family but by 1904 they were living at 20 Upper Tollington Park in Finsbury for this is the address listed on Louise Emma's entry in the burial register for Brompton Park Cemetery. She is buried with Edward after a long and illustrious life.